After yeoman’s service in World War II, the venerable Sherman tank saw several more decades of service in the Israeli Army. From its inception, Zahal, the Israeli Army, has been forced to use ingenuity and improvisation to arm itself against its Arab enemies. In the first years of its life, the tiny nation of Israel, surrounded by enemies pledged to its destruction, found modern weapons few and hard to come by. Such armaments were desperately needed, and the Israelis became adept at filling the gaps in their inventory by acquiring whatever weapons they could from a variety of unusual sources. Once in hand, these weapons often had to be rebuilt or modified to remain effective. Many of them would have been considered obsolete on a European battlefield, but the Israelis made them work. They had no choice—defeat meant the annihilation of their state. One of the best examples of Israeli ingenuity is their long use of the American-built M4 Sherman tank, that ubiquitous Allied workhorse of World War II. Often decried as inferior to its German opposites because of its relatively thin armor and less effective armament, the Sherman was nonetheless rugged, reliable, and capable of being modified and improved. It was this last quality that enabled the Israelis to use it so effectively. At its birth, Israel’s military possessed a limited number of armored vehicles, mostly scout cars and truck chassis hastily converted into armored cars with the addition of armor plating and a machine gun or two. Israel’s initial tank force consisted entirely of old French Hotchkiss tanks, obsolete even in the beginning of World War II. Desperate for better tanks, the Israelis literally went to the scrap heap: junkyards in Palestine, Europe, and as far away as the Philippines together contained hundreds of tanks left over and abandoned during the recent global war. A British scrap yard in Palestine contained the salvageable hulks of one or two Shermans (sources differ). At least one more came from an Italian junkyard. These tanks were smuggled back to Israel, at times disguised or mislabeled as “tractors,” to become parts of the motley collection of weapons that could be used to preserve Israel’s newfound existence. Since these tanks came from junkyards, they were generally unserviceable and required extensive work to get them into shape for combat. Some of the tanks had been “demilitarized” specifically to prevent anyone from reusing them. Often, this was done by drilling holes in the cannon tube or other mechanisms needed for the main weapon. Repairs were made, and the Shermans returned to action with the Israeli Army. The polyglot nature of the Israeli Army meant troops often were grouped into units based on their native languages. One Sherman tank and two ex-British Cromwell tanks were grouped together in an “English Company,” so named because its members all spoke English. This company was part of the 82nd Tank Battalion that helped capture Lydda Airport during the 1948 war. It also fought at Latrun, where some of its tanks were lost to an Arab Legion 6-pounder antitank gun. Fortunately for the Israelis, the Arab forces operating against them were not particularly well-mechanized for the most part. After the United Nations cease-fire took hold in mid-1948, Israel used the breathing room to increase the size of its armored and mechanized forces. Although unable to purchase new vehicles, the Israelis had plenty of leftover World War II materiél to choose from, and this formed the backbone of Zahal’s strength. Quickly, a force of some 300 half-tracks and 50 tanks was assembled. Most of the tanks were Shermans, still being gathered from scrap yards throughout Europe and elsewhere. The collection was a varied one, including M4A1 and M4A2 models with diesel engines. Their armament was a cross-section of guns the Shermans had carried into battle in Europe a few years before: 75mm and 76mm cannon and 105mm howitzers; a few of the tanks even sported World War I-era German-built 77mm field guns made by Krupp. These were installed to replace damaged guns or demilitarized weapons Zahal ordnance workers had been unable to restore to firing condition. While the haphazard nature of the Zahal tank force meant a varied assortment of M4s was gathered, these followed the basic proportions of the Sherman tank. An M4A1 weighed in at 66,500 pounds. It was 19 feet, four inches long and eight feet, seven inches wide, and sat nine feet high. The crew of five included a commander, gunner, loader, driver, and assistant driver-hull machine gunner. The tank could achieve 24 mph on roads and 15-20 mph cross-country. Range varied from 100 to 150 miles, depending on engine type. The Shermans normally carried one coaxial and one hull-mounted .30-caliber belt-fed machine gun. While a .50-caliber M2 machine gun was usually fitted atop the turret, Zahal was at first short of these potent weapons and often fitted old German and Czech machine guns in their place. Later, when the French began to supply M2s, they were mounted in their original place. The Israelis gave the collective designation of M1 to its entire Sherman force. During the 1948 war, Zahal had used its few tanks primarily in an infantry-support role, and initially that doctrinal role was retained. However, by the early 1950s this was changing. The original 82nd Tank Battalion had merged with the 9th Commando and 79th Mechanized Battalions to form the 7th Armored Brigade. Under the leadership of Uri-Ben Ari, a more offensive mind-set and tactics were practiced. In its 1952 and 1953 war games, Israeli infantry found themselves in mock retreat from attacking Shermans. This so impressed one observer of the maneuvers, Prime Minister David Ben-Gurion, that he ordered more Shermans acquired at once. By fortuitous coincidence, Israel found France a willing seller of surplus Shermans at this point. At the time, the French were fighting a guerrilla war in Algeria, and Egypt was giving the rebels support. In retaliation, France approved military assistance to Israel. Besides training Zahal officers at French military schools, the French also sold them 100 new AMX-13 light tanks and 60 surplus Shermans. With this fresh infusion of equipment, the Israelis were able to form two more armored brigades. An M4 Sherman medium tank in Israel’s Yad la-Shiryon Museum combines a M4A4 hull and a M4A2 engine. In 1956, Israel began to cooperate with France and Great Britain, which had plans to seize the Suez Canal after Egyptian President Gamal Abdel Nasser nationalized it. Israel, for its part, was upset over Egyptian border raids. With renewed fighting impending, Israel asked France to supply 100 improved Shermans known as the M50. This tank mounted a long-barreled 75mm high-velocity cannon used in the AMX-13. To accommodate the new gun, an extension was built on the turret rear and a new gun mantlet was designed. Some models used a gasoline motor for propulsion, while others employed Cummins diesel engines. These improved tanks were referred to as “Super Shermans” and had a marked increase in firepower to offset the newer Soviet T34/85s the Arab nations were then starting to receive. Only a few of the Shermans were available in time for the 1956 war. Ironically, many of the Egyptian armored vehicles initially placed in the Sinai peninsula were also Shermans, including one company of M4/FL10s, a Sherman hull that mounted an AMX-13 turret. Equivalent to the Israeli M50s, they were also French-built, although by a different company. During Operation Kadesh, as the Israelis labeled their part in the 1956 fighting, one battalion each of the 7th, 27th, and 37th Brigades were equipped with Shermans, including the few Super Shermans. The 7th fought at Abu Ageila and sent a detachment to aid Zahal paratroopers at Mitla Pass. Both the 7th and 37th Brigades fought at Um Katef, where the commonality of tanks on the two sides caused a tragic friendly-fire incident. On November 1, as Israeli units advanced against Egyptian positions from different directions, they mistook each other for the enemy. The 7th knocked out eight of the 37th’s tanks before the situation was brought under control. (The Arab troops had quietly withdrawn before the Israeli arrival.) Overall, however, the Israelis fought well, skillfully using their old Shermans. After the war Israel, now recognizing the utility and power of its armored formations, decided to increase the number of armored brigades from three to nine and organized these units into ugdas, division-sized groups that combined brigades for specific operations. As the nations opposing Israel began to shift into the Soviet bloc, Egypt and Syria in particular started receiving more advanced tanks, including T34/85s and T54s. This caused the Western nations to agree, in turn, to supply Israel, clandestinely in some cases but later openly. American M47 and M48 Pattons and British Centurions began to trickle into Zahal’s inventory. Until enough were on hand, Israel had to make do with its force of now-outgunned Shermans and AMX-13s. Something was needed to plug the gaps. That something was the M51, also called the Isherman. This was the ultimate evolution in Sherman battle tanks. Atelier de Bourges, the French company that developed the M50 Super Sherman, developed a 105mm cannon with lower recoil that the Sherman hull and a modified turret could withstand. These T23 turrets also had new mantlets and a rear turret extension. This potent modification made the tank heavier, and to compensate for the added weight, a new Cummins 460hp diesel engine, wider tracks and a new hydraulic system were also installed. Some 200 of Israel’s Shermans were altered, breathing new life into the old design. Super Sherman tanks during winter naoeuvres in the Negev. 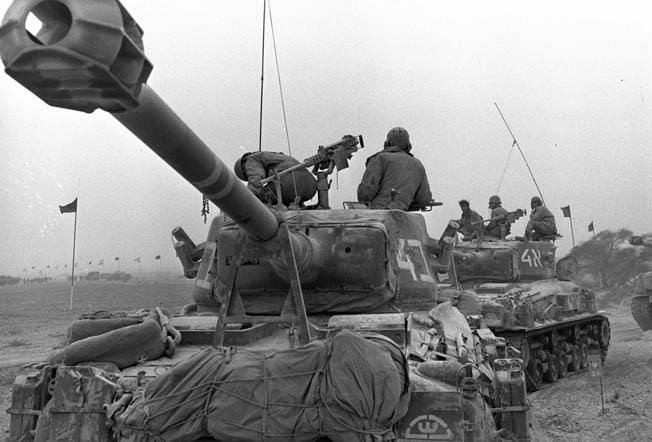 The tanks went into combat alongside Zahal’s newer ones in 1967’s Six-Day War. Israel, convinced that its neighbors were coordinating an all-out attack, decided to strike first, concentrating against Egypt before turning to Syria. Jordan also became involved. Shermans were used on all three fronts. A battalion of Ishermans took part in the attack on Abu Ageila, diverting the defenders’ attention while a combined infantry-airborne assault took the position. On the Jordanian front, the Sherman-equipped units had a harder time against Jordan’s M47 and M48 Pattons. In one engagement, the Jordanians claimed 17 Shermans, destroyed around Jenin and Ya’Abad. In another fight, the Shermans came out on top, however. As a column of Jordanian M48s was retreating, it ran into a patrol of Israeli Shermans. A sharp fight broke out at point-blank range, and the Jordanians left behind 15 tanks on the field. Against the Syrians, Israeli tank losses were heavy because of the intense fighting. Ironically, the Syrian Army was equipped with refurbished World War II-era Panzer IV and Sturmgeschutz IV assault guns purchased from France—the same tanks the Shermans had faced two decades earlier. 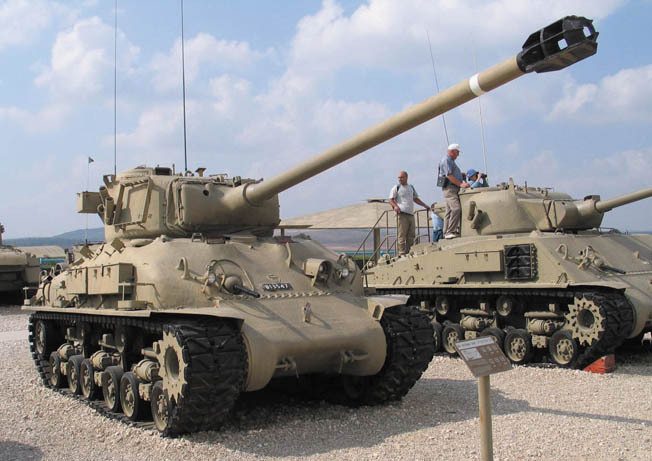 Although the Shermans had done their part in the Israeli victory of 1967, after the war more modern tanks began entering the service, and the old workhorses were showing their age. The M51 models were kept, but many of the M50s were retired, a few being sold and others having their chassis converted into different types of vehicles. A few remained operational, and during the 1973 Yom Kippur War, Sherman tanks still served, although they had been largely supplanted by newer designs. The Shermans’ service was not yet over, however. The chassis of the venerable workhorses were used to create new vehicles and fill other roles in the Israeli arsenal. The first was the Model 50 self-propelled howitzer. Zahal had a large number of French-built Mle50 155mm howitzers on hand; these were mated to a Sherman chassis. The engine was moved to the front of the hull and the gun mounted in an open-topped compartment in the rear. Batteries of the guns served in both the 1967 and 1973 wars before passing into reserve use. The Mle50 howitzer had a range of 11 miles. An interesting variant of the vehicle was a fully tracked ambulance for evacuating wounded soldiers under fire. The Israelis have always been protective of casualties, and make every effort to evacuate wounded troops. The ambulance could carry four wounded soldiers and a medic in a fully enclosed rear compartment. When evacuating under fire, the vehicle had the advantage of being able to park its front end toward the incoming fire. This placed its thickest armor and entire engine compartment between the enemy and the evacuees, as long as the incoming fire was not of sufficient caliber to disable the engine with penetrating fire. A second self-propelled gun also was built. The L33 conversion of the Sherman chassis mounted a Soltam M68 155mm howitzer in a large, fully enclosed armored superstructure, giving the crew protection from overhead shell bursts and fragments. The Soltam cannon had a range of 141/2 miles. They first entered service in the Yom Kippur War and also served in the 1982 war in Lebanon. Another ingenious conversion was the Makmat 160mm mortar carrier. This vehicle has an open-topped compartment forward (the engine is retained in the rear) that holds a Soltam 160mm mortar. The high-angle fire of a mortar requires an open top. The front and side panels of the compartment can be folded down to provide easier access and more room for the crew, although at the sacrifice of some protection. The mortar carrier entered service in 1968. Two further Sherman variants included a multiple rocket launcher carrying four 290mm rockets and an observation vehicle with an extendable platform in place of the turret. The platform could be raised up to 90 feet and was used along the Suez Canal as a mobile observation post. M51 Sherman with a French-made 105mm gun, diesel engine, and wide track and suspension. The tank was used in the Six-Day and Yom Kippur Wars. 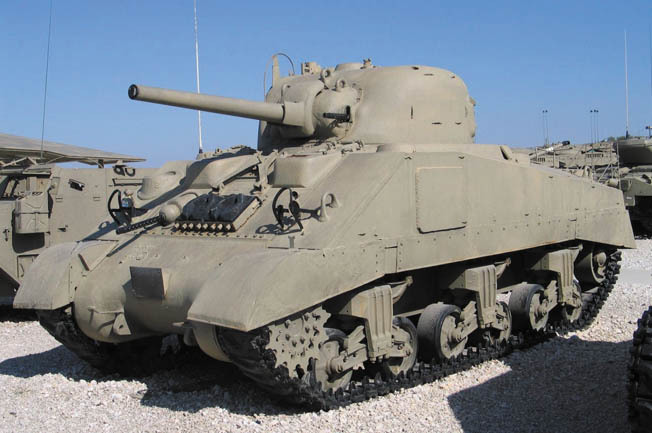 The Sherman in its various configurations filled gaps in the Zahal order of battle over the course of several decades, until the Israelis gradually were able to purchase more modern tanks. With French assistance, these Shermans were kept viable with upgrades to their weapons, engines, and hydraulic systems. When their usefulness as tanks ended, the chassis found new life as artillery and mortar carriers and a variety of battlefield support vehicles. If necessity is the mother of invention, then the Israeli Shermans are a testament to both the need and the ingenuity of the Israeli Army. Tags Arab Legion, Arab-Israeli War, British Centurion, Egypt, Gamal Abdel Nasser, IDF, Lebanon War (1982), Operation Kadesh, Sherman Tank, Six-Day War, Suez Canal, Suez Crisis, Super Sherman, T-34 tank, United Nations, WWII, Yom Kippur War, Zahal.